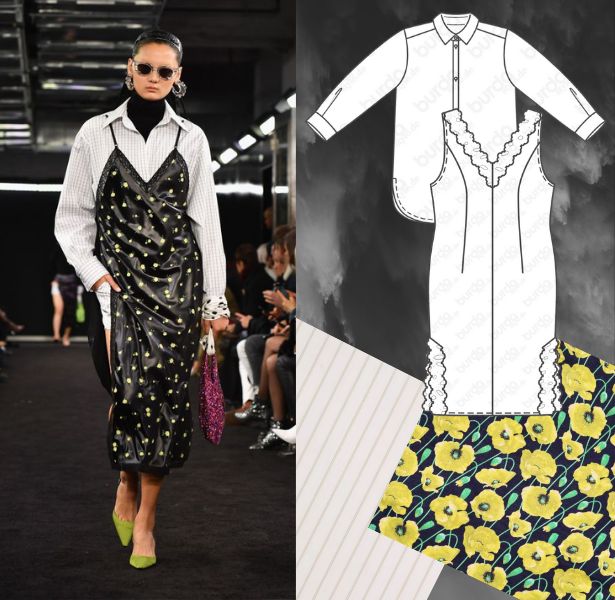 Before recapping the trends from all the runway Ready-To-Wear shows for Fall 2019 I wanted to first show my personal favorite looks shown and how to recreate them using BurdaStyle patterns! 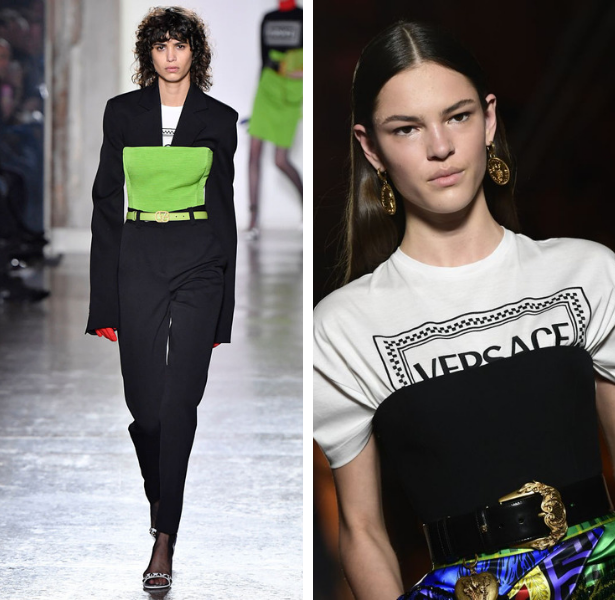 There were so many amazing looks that walked down the catwalk in New York, London, Paris, and Milan – but I narrowed it down to the ones I want to recreate for my fall 2019 wardrobe. 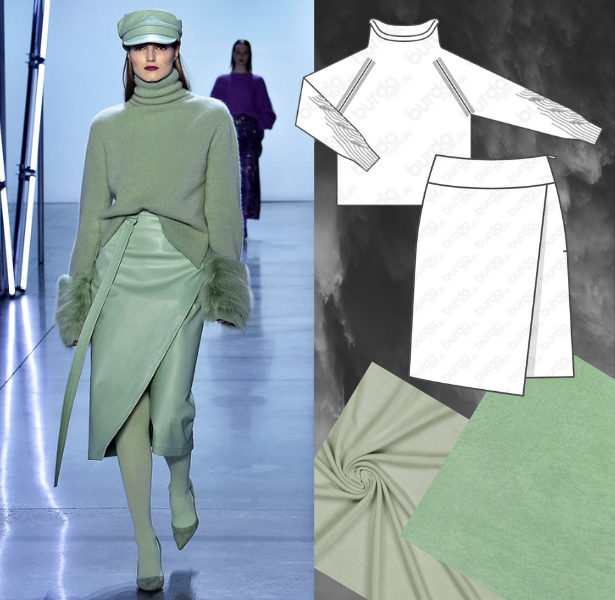 This paler green color was seen a lot, and I love how it’s done here for the Marc Jacobs show. This dress is a simple silhouette and is sewn in a heavier weight fabric suitable for the cooler months. For the pattern I would make this negligé and lengthen the hemline closer to the ankle and would sew in a sage green wool. Perfect for layering too! Now this is a look that I could even make now to wear in the spring! Michael Kors had major seventies vibes, and I was loving it. 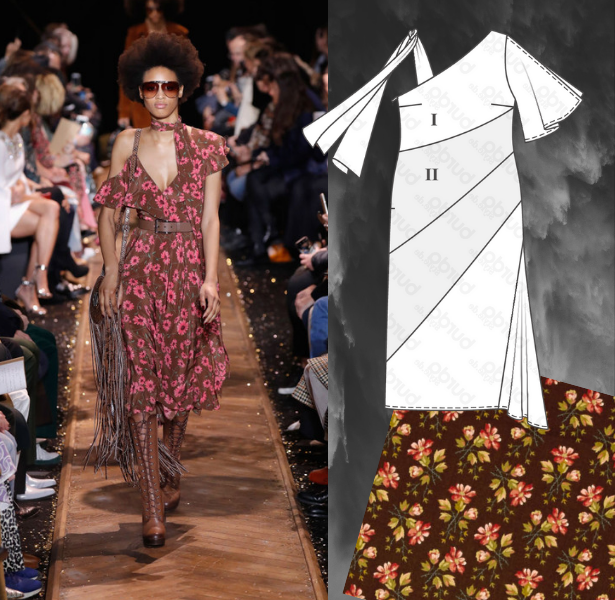 This dress caught my eye since I didn’t hate the brown floral print and the neckline intrigued me. To recreate this look I would actually make this plus size dress because of the one sleeve and shoulder tie. 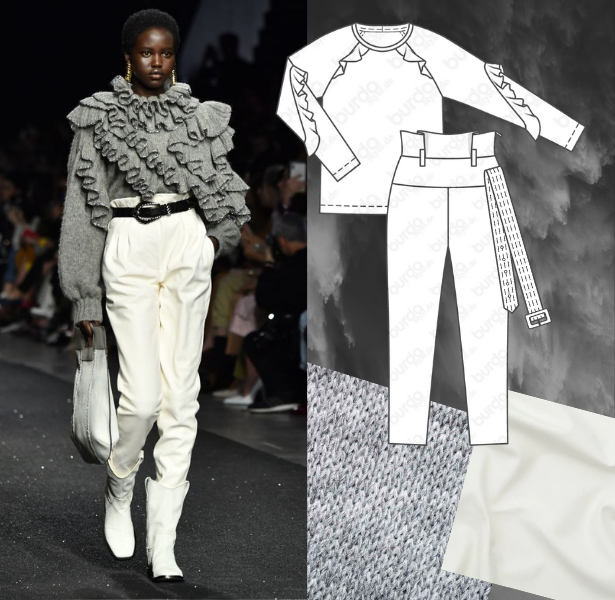 Salle Lapointe showed many monochromatic looks and I loved this look with the mix of sequin and sweater knit – it just looked so cozy chic! 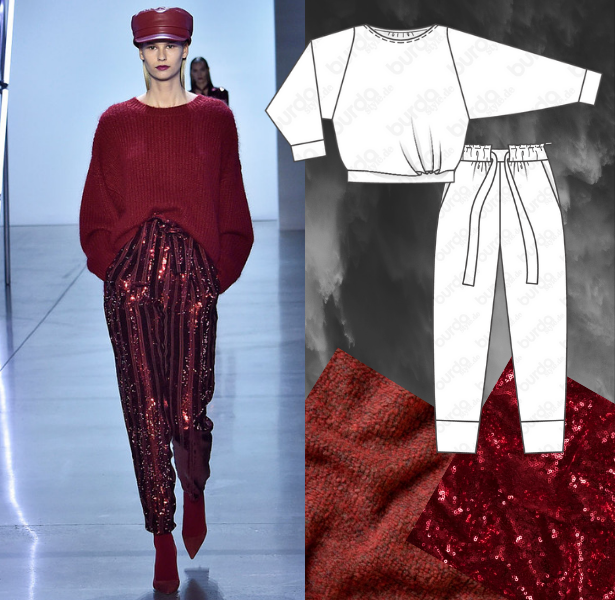 For the top I would sew this sweatshirt pattern in a red knit and for the bottoms I make these tie waist trousers. This whole looks just screams comfy pajamas to me. I’m always a fan of pretty much anything Alexander Wang shows, but this look really caught my eye. I have wanted to rock the dress over blouse look for a while now, and I love the combo of this one with the turtleneck too. The large slit on the side exposing the bottom of the long blouse is an interesting take that I’m into as well. To make this look I would use this blouse pattern with long sleeves paired under this lace slip. For the turtleneck portion to reduce bulk I would just simply sew a dickie! A large ruffle is always a good thing in my book! Alberta Ferretti showed this look that I absolutely loved as I’m still not over an exaggerated sweater. High waisted pants are also a favorite of mine and I haven’t sewn a pair in a while so this style got me inspired. I would use this ruffled pullover pattern, but draft and add A LOT more ruffles, then for the bottoms I would make this patterns in a striking white wool fabric. 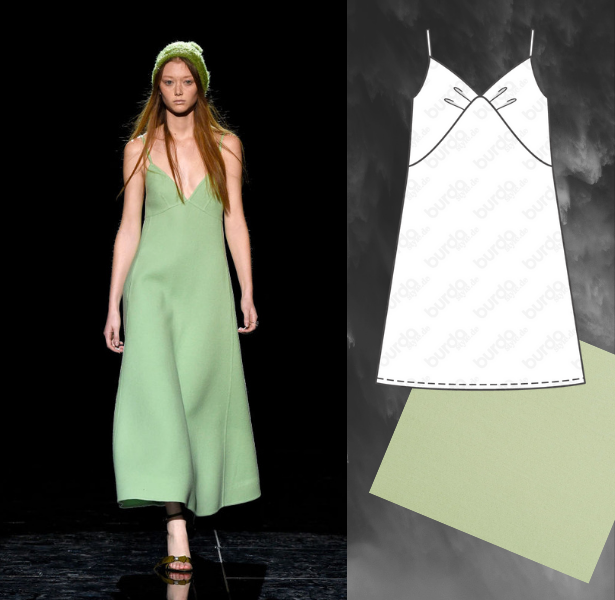 Here is another Sally LaPointe that I loved, especially since this look was all green! The mix of faux fur, leather, and sweater fabric had me feeling all warm and fuzzy inside. This is probably my favorite look of the entire season. To recreate of course I would have to find a matching hat and tights, but I would make this knitted pullover – or probably commission someone to knit it for me. Then for the skirt I would have to sew this one in a buttery soft green faux leather. You can never go wrong with some Versace, and the over corset really had me head over heels. I was really into the corset over T-shirt look! 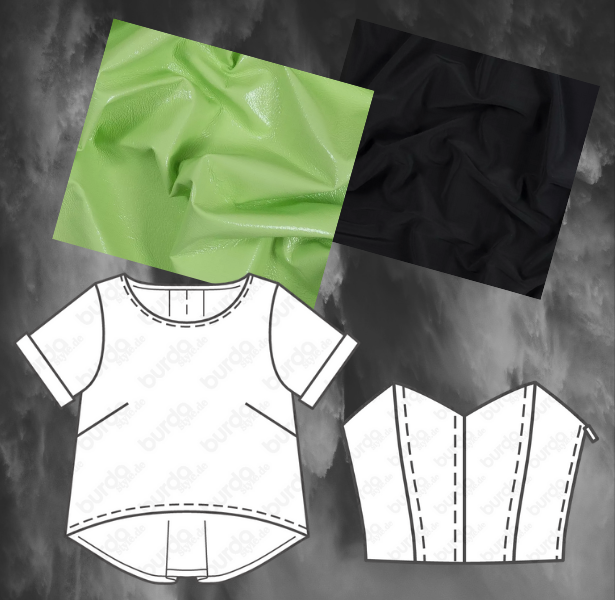 To achieve this style I would sew this cropped T-shirt pattern paired under this bustier in both limegreen and black. Every February and September I love browsing through all the runway shows to see what inspires me and what all the designer are showing. Later I’ll do a trend round up post to get you all ready for Fall 2019. Love the ruffled grey knit top comparison to the Burda Style pattern!